A service mainly represents a unit of work done by your company for your clients. Services can also represent surcharges, discounts, taxes, fees, and spare parts. Feature: LaborPriceType, Basic Parts, Hail Damage Package, Bundles, FeeBundles, Price Policy. On the Services page you can add new services, edit existing services, move no longer available services to archive, and restore archived services which are again available. To add a new service, on the Active tab, click Add on the toolbar, enter settings, and click OK.
To modify an existing service, on the Active tab, click Edit next to the appropriate service, change settings, and click OK.
To move an existing service to archive, on the Active tab, click Archive next to the appropriate service. To restore an archived service, on the Archived tab, click Restore next to the appropriate service. In the Services list you can also see services packages to which services are assigned, track the history of changes which are made to services, and select available actions. To see assigned packages, in the Packages column, point to the Packages link next to the appropriate service. To see the history of changes, click Audit Log next to the appropriate service. To select available actions, in the Action column, click the Select button next to the appropriate service. On the Audit Log page you can see what changes were made to a service, when and who made these changes. Note An exact list of actions depends on service price type. On the top toolbar there are options that let you change the type of services, assign services to service package, export services to CSV, and specify service discounts and fees. To change the type of services, select the check box next to the appropriate services, click the appropriate service type in the Service Type box, and then click Change. To assign services to a service package, select the check box next to the appropriate services, click the appropriate service package in the Service Package box, and then click Assign. To export services to a file in the CSV format, click Export to CSV. To add, edit, delete, and assign discounts and fees, click Manage Discounts/Fees. On the bottom toolbar you can manage service types and export services to CSV. To add, edit, or delete service types, click Click to Manage Service Types. On the Discounts/Fees page you can add, edit, and delete discounts and fees, as well as assign them to services. To add a new discount or fee, click Add on the toolbar, enter settings, and click OK.
To modify an existing discount or fee, click Edit next to the appropriate discount or fee, change settings, and click OK.
To delete an existing discount or fee, click Delete next to the appropriate discount or fee. Discount / Fee is a name of the discount or fee. Wholesale is a rate that is applied to wholesale clients. Retail is a rate that is applied to retail clients. Override WO Discount means that discounts applied on the work order level are overridden by service discount. Note Discounts and fees cannot be set for services with the Price Matrix, Percentage, Bundle, and Bundle Fee price types. When you create a new service or edit an existing service, you enter or change settings in the service profile. Service Type lets select one of service types which are mainly used for showing appropriate damage icons on visual inspections. Learn more about service types. Multiple means that service quantity can be changed and service can be added to inspections and work orders more than one time. Price Type defines how service amount is calculated as well as whether service can include other services. Learn more about service price types. Money price type can be used for services with a fixed price. Labor Time lets specify time required to perform the service. This option is used for technician commissions calculation and is available if the Back Office application is subscribed to the CommissionHourlyRate feature. Labor price type can be used for services charged per hour. The Labor price type requires subscription to the LaborPriceType feature. Use Labor Time lets automatically determine approximate labor time required to repair a particular vehicle part. Source lets select the appropriate source for operations data. Now only one default source is available for selection. Operation lets assign a labor operation to service. Parts price type can be used for services that allow selecting a particular spare part from a built-in parts catalog. The Parts price type requires subscription to the Basic Parts feature. Category, Subcategory, and Part Name let specify service category, and then subcategory, and then spare part. Percentage price type can be used for surcharges, discounts, and taxes (services that increase or decrease the amount of main services in inspections and work orders). Is Tax means that service is calculated as tax when it is added to an inspection or a work order. Use Sales Tax Database means that tax rate for this service is automatically set depending on customer location. This option is available for Avalara Sales Tax subscribers. Tax Rate Can Be Overridden means that sales tax rate can be edited on device. Price Matrix price type can be used for dent repair services. The Price Matrix price type requires subscription to the Hail Damage Package feature. Bundle price type can be used for services that can group multiple services. The Bundle price type requires subscription to the Bundles feature. Bundle lets assign a bundle package to service. 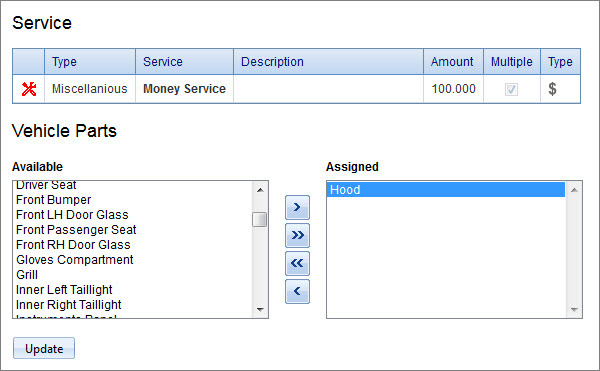 Fee Bundle price type can be used for services that automatically add a fee amount if certain services are added to work orders. Fee Bundle lets assign a fee bundle package to service. Price Policy defines how service amount is calculated based on service price and quantity, as well as how work order amount or inspection amount is calculated based on service amount and number. The Price Policy setting requires subscription to the Price Policy feature. The Price Policy setting is available only for the Money price type. Services with other price types have the Service price policy by default. Learn more about service price policies. Service means that service amount depends on service quantity and work order amount or inspection amount depends on how many times this service is added. Vehicle means that service amount does not depend on service quantity and work order amount or inspection amount does not depend on how many times this service is added. Panel means that service amount does not depend on service quantity and work order amount or inspection amount does not depend on how many times this service is added for the same panel. Flat Fee means that service amount does not depend on service quantity, but work order amount or inspection amount depends on how many times this service is added. Prices section lets specify service prices for all services except for services with the Price Matrix and Fee Bundle price types. When service is saved, service price adjustments can be set up, so that service price can be automatically adjusted based effective date, package, area, team, client, and job. Learn more about service price adjustment. Wholesale Price defines service price for wholesale clients. Retail Price defines service price for retail clients. Question Section lets assign a question section to service, so that technicians can answer questions from selected question section while adding service to inspections and work orders. Discount Exempt means that no discount can be applied to service. Tax Exempt means that no tax can be applied to service. Vehicle Parts lets assign vehicle parts to service. 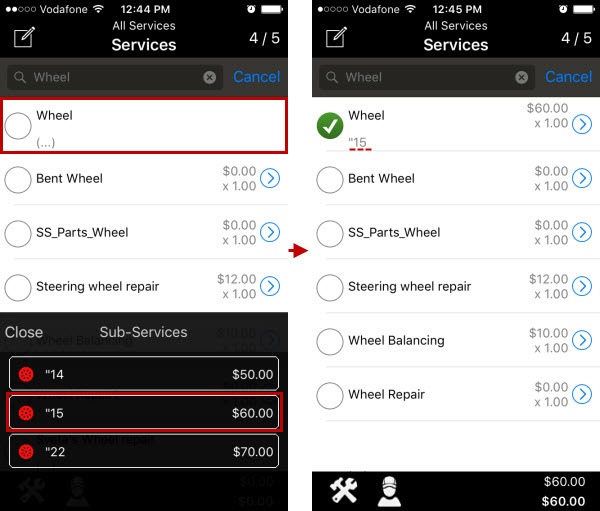 When service is saved, the Vehicle Parts label turns into the link that opens the Vehicle Parts page. Required means that this service cannot be added to an inspection or a work order without a selected vehicle part. Internal Expenses lets add service expenses. When service is saved, the Internal Expenses label turns into the link that opens the Service Expenses page. Tech. Commissions lets specify fixed or percentage commissions for assigned technicians if the Back Office is not subscribed to the New Commissions Type feature. Commissions Mode defines whether specified commissions are split evenly between assigned technicians or each assigned technician gets specified commissions. Default Technician defines the technician that is automatically assigned to this service when it is added to a work order. Team House Account means that service is automatically assigned to an employee with the Team House Account type based on work order team. Location House Account means that service is automatically assigned to an employee with the Location House Account type based on work order location. 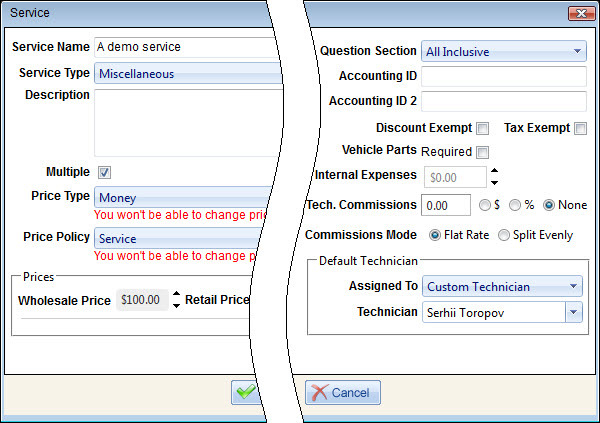 Custom Technician lets select a particular employee that is automatically assigned to service. On the Service Vendors page you can assign internal and vendor teams to service and specify the price at which service is provided to your company’s clients by teams. 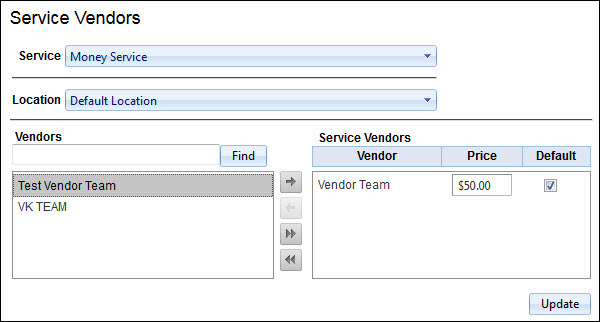 On the Service Vendors page, click the appropriate repair location in the Location box, click the appropriate teams in the box on the left, and then click the button with the right-pointing arrow to move selected vendor teams to the box on the right, enter service price in the Price column, and then click Update. On the Sub-Items page you can add, edit, and delete service sub-items. To add a new sub-item, click Add on the toolbar, enter settings, and click OK.
To modify an existing sub-item, click Edit next to the appropriate sub-item, change settings, and click OK.
To delete an existing sub-item, click Delete next to the appropriate sub-item. Note Services with the Price Matrix and Bundle price types cannot have sub-items. Tip Sub-Items are shown on device when you tap the parent service. On the Assigned Discounts/Fees page you can set a service discount or fee, so that service price can be automatically adjusted based on the discount or fee rate. 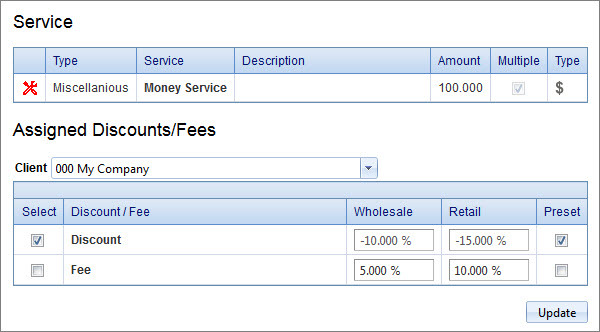 To set a service discount or fee, select a client in the Client box, if you want the service discount or fee to be applied only to this particular customer, select the check box in the Select column next to the appropriate discount or fee, change the rate in the Wholesale and Retail columns, if needed, and select the check box in the Preset column, if you want the discount or fee to be applied by default. Note Discounts and fees cannot be set for services with the Labor, Price Matrix, Percentage, Bundle, Bundle Fee price types. On the Vehicle Parts page you can assign service to vehicle parts. To assign service to vehicle parts, move the appropriate vehicle parts from the Available box to the Assigned box, and then click Update. 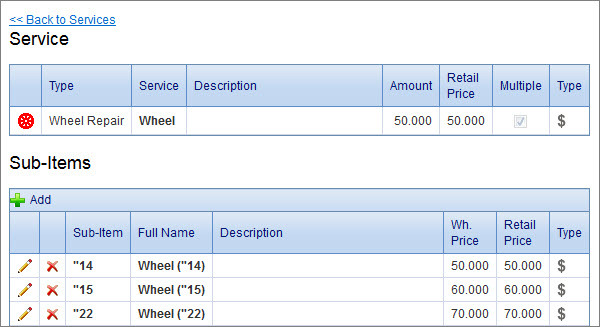 Note Vehicle parts cannot be assigned to services with the Price Matrix, Bundle, and Bundle Fee price types. Also vehicle parts cannot be assigned to services with the Percentage price type if the Is Tax check box is selected, and services with the Labor price type is the Use Labor Time check box is not selected. 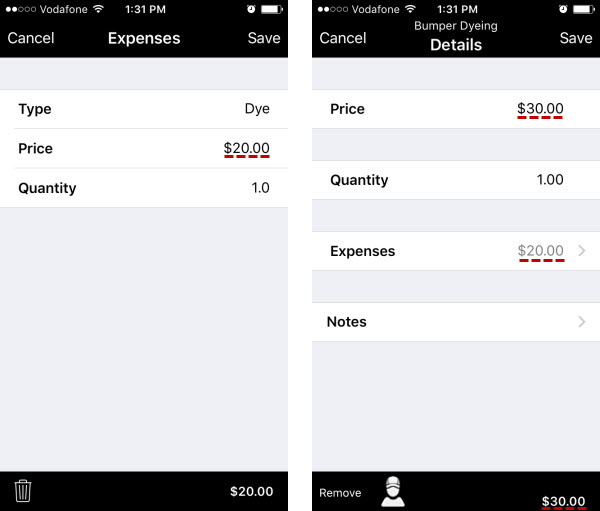 On the Expenses page you can add, edit, and delete service expenses. 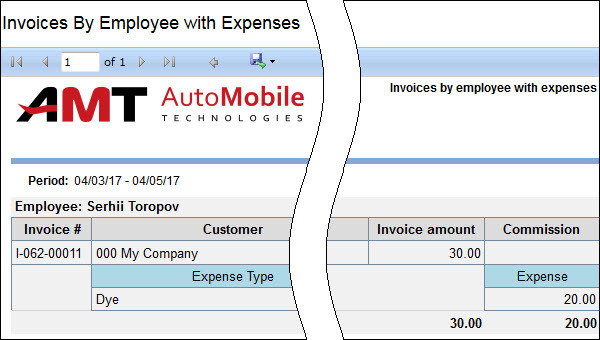 To add a new service expense, click Add on the toolbar, enter settings, and click OK.
To modify an existing service expense, click Edit next to the appropriate service expense, change settings, and click OK.
To delete an existing service expense, click Delete next to the appropriate service expense. Price Type is the price type of the service to which expense is added. You cannot change price type. Type lets select one of the available expense types. You cannot select the same expense type twice.